The operator reported that the pilot had been spraying fields for about 2 hours. The pilot was advised of wires in a field he was about to spray, and before loading, he flew to the field to look for them. As he was flying north over the field, the helicopter collided with the east/west running wires that were about 30 ft above the ground. The wire wrapped around the mast, and the helicopter subsequently collided with the ground coming to rest inverted. The pilot reported that he never saw the wires, and that there were no mechanical anomalies with the helicopter that would have precluded normal operation. The operator reported that this accident could possibly have been prevented if the field had been looked at during the daylight. 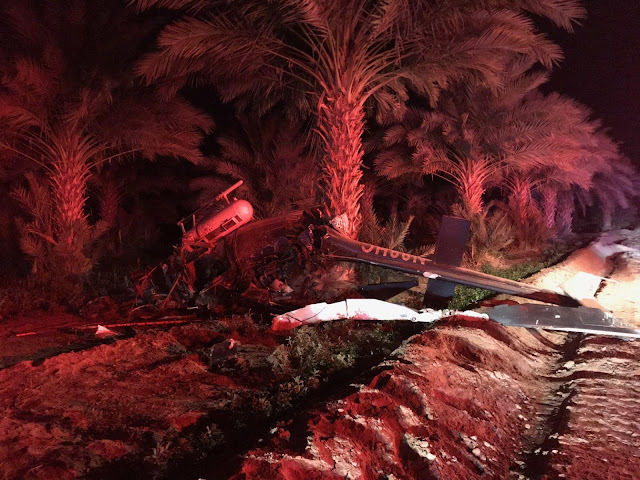 A pilot was injured late Friday night after the crop duster he was flying crashed in a field in the area of County 14th Street and Avenue B, according to information provided by the Rural/Metro Fire Department. According to the Rural Metro Fire Department, the crash happened at around 9 p.m. that involved a crop-dusting helicopter. Firefighters arrived at the scene and secured the area due to the downed power lines. The helicopter pilot was treated at the scene and was transported to a nearby hospital. Power lines near the area are currently down so fire officials are warning the community to avoid the area. Arizona Public Service currently at the scene.